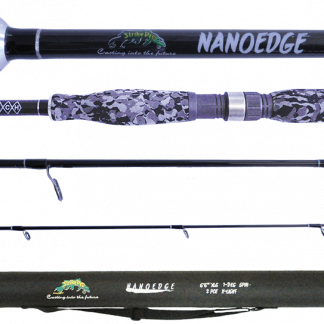 The Strike Pro Nanoedge Rods feature the latest in fishing rod design and technology being produced using Nano Particle Technology. What does this mean?. The blank is created with 3 separate layers of high modulus carbon wrapped around a graphite core, then it is reinforced by woven fibre and bound together by SPECIAL NANO EPOXY RESINS, these bind all the layers together producing the end product. This creates a blank that is extreamly light, sensitive and very responsive but it has extreme strength and is durable enough to stop larger fish in their tracks and stop them getting back into cover. These rods have been designed with the lure angler in mind. Whether you fish Soft Plastics or Hard Bodied lures you will find these rods a pleasure to use. The Strike Pro Nanoedge Rods feature the latest in rod building components that compliment the quality of the blank to give you the feel of a custom built rod. They feature High Density Camo Shaped Grips, Fuji Reel Seats, Fuji ‘K’ Frame guides & tip with Stainless Steel Frames and Alconite Rings, Aluminium Winding Checks, Folding Hook Holders, Fighting Butts and all come with a beautiful Hard Tubefor added protection.